Srikanth Addala has a unique view about life and living that is delinked from the material values that fill our daily moments. Most of his films have the touch of rustic beauty, unalloyed emotions and subtexts beyond the grasp of vocabulary. “Brahmotsavam” is another film coming from those perspectives which are at once autobiographical and also commentary-like on the state of the world today. But contrary to expectations, the film falters in delivering the final message of living together and seeking out our own kith and kin from far and within. It doesn’t just falter, it loses a great opportunity to rekindle the emotions in needless narrative of 156 minutes with larger-than-life motifs and scenes that do not pack a punch. The net result of “Brahmotsavam” despite grand intentions is that Mahesh Babu gets one of the weakest films that does no justice to his potential even though the image is preserved. While this is not exactly a film for his fans, the x factor that usually over-fills his films is missing even as he struggles for screen space with too many faces that sometimes freeload on the screen time making the film lag at many times. Mahesh Babu is very confident of film’s success and said that the concept will strike a chord with all age groups. He said Brahmotsavam is a wholesome entertainer brimmed with family values and emotions that are missing in the modern day. The promotional blitzkrieg has escalated the buzz on the film. The film is releasing today amidst huge expectations. Let’s see if it can match the expectations of the audience. The basic thread of the story is not something that requires an attempt of this magnitude: Satyaraj is the founder of a Paint business last valued at Rs.400 crores. His magnanimity and humility comes from the small help received from Rohini Hattangadi’s husband to set a small shop which grew into the conglomerate today. Satyaraj shares his wealth and affection with a larger family that includes Rohini’s four sons – Rao Ramesh, Shayaji Shinde, Naresh and Krishna Bhagwan. Rao Ramesh is the villain who harbors feelings of jealousy and ill-will towards the patriarch and wants to see his daughter Praneetha marry Mahesh, son of Satyaraj. The story has a twist in the interval block but later loses its way in fulfilling the desire of Mahesh to find his family roots right upto the seventh generation. A love story or two in between to introduce two leading heroines is what makes the screen hum a bit. Srikanth credits himself as the man who penned the story, screenplay, dialogues and directed the film. That seems to be taking too much load on his sense of narrative and visual story-telling. Even though the dialogues have been blessed with the touches of the late Ganesh Patro and Krishna Chaitanya, they are effective only forty per cent of the time. Except the heart-tugging dialogues between Satyaraj and the family and those between Samantha and Mahesh and the punchlines of Rao Ramesh, there is lot of inertness in the lines of many characters which do not create impact. Screenplay of Srikanth has been always a lazy man’s effort to go through the motions. In the first half, the songs interrupt the flow of screenplay in a jarring fashion. In the second half, the screenplay interrupts the flow of the remaining two songs, of which the title song itself struggles to complete itself in jumpstarting visuals. In terms of direction, Srikanth needs to uplift himself to a level that the audience can sit back and enjoy rather than become more and more listless and finally restless. He has to make scenes interesting and complete with an intensity, otherwise, he should not attempt scenes. For example, the scene between Praneetha and Mahesh, the scene of confrontation between Mahesh and Rao Ramesh, the color splashing scene between Mahesh and Kajol in the first half should have ended with some logical conclusion. Instead, the scenes come and jump off into the next one or a new song with confusing frequency. While he got the cast of a lifetime, Srikanth failed to extract the salient potential of most characters except Satyaraj, Mahesh, Rao Ramesh, Samantha, Kajol and Jayasudha. While the first half of the film looks more colorful, romantic and grandiose, the story hardly moves an inch. 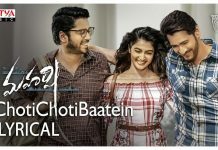 Instead of over-investing in the romantic track between Mahesh and Kajal, the director should have concentrated on the characterization of the elderly and create conflict that sets the tempo in the second half. The second half is interesting with the entry of Samantha and loosens a bit until it becomes monotonous after the first twenty minutes once Mahesh goes from city to city in search of his ancestors’s whereabouts. But the sense of completeness is missing here too which shows the gaping holes in Srikanth’s direction. The best film-makers are experts in story-telling and masters of gestalt narration which means they have a sense of completing the blanks in a viewer’s mind. Who are the seven generations? Why is Mahesh seeking them now when his father knows three generations already and always maintained a dairy? And who is looking after the family business if he is backpacking pan-India? The biggest loophole is that Mahesh kneels before the three generations just like his father even if he feels an emotional connect with his father only? Then shouldn’t one of his father’s photos be added? Questions like this make you restless in the second half even as the director on his own trip in showing a documentary of places and new characters with uninteresting angles. Also, the scope for friction between the cousins should have been established more emphatically and linearly. Interval Block is good and gives scope for good performance for Mahesh which he emotes well. Satyaraj steals the show with his dignified acting and graceful paras on life and living. He is the soul of the film and the film is watchable in every scene he shows up. After “Mirchi” and “Bahubali”, this is a milestone for his career in Telugu films. Mahesh shines in his dressing and subtle acting; his romancing skills have gone a notch up with this film as he is comfortable with both Samantha and Kajal like never before. But this is a film where his role is not highlighted well-enough. Also, there is a textual commonality with his role in “Srimanthudu” which becomes very predictable and boring for even die-hard fans. The side-smile, the minimal dancing, the pounding fistwork in stunts and the winky face he makes when he is uncomfortable facing camera – all these are moments that fans have seen before. Can he surprise people with more improvisation and variety? It is time for more. Samantha sizzles the screen better with his vivacity than the glamor sprinkled by Kajal Agarwal. Jayasudha and Revathi say their lines well but the screen should have got burnt between them with some scenes set up together. Tulasi actually gets the better lines between the three lady characters. Vennela Kishore is the only one who infuses some comedy but he needs to slow down his dialogue delivery for people to catch breath with his words. The talented child artist Avantika should have got atleast one line to say in the film. Krishna Bhagwan fails to fire us to laughter. Cinematography by Ratnavelu is terrific and the set design by Thota Tharani stand out. The Brahmotsavam set looks truly authentic and gives you the divine feeling. Music by Mickey J Meyer is quite pleasing to the ears but the blame must fall on the director for imbalancing the rhythms by placing five songs in the first half and only two in the second half which screws up the whole pace of the film. Gopi Sundar seems to have used his extra-sensory perceptions about the film’s narrative by infusing new life into the BGM at many places in a way that the director couldn’t have matched up. On the whole, there are many films like “Pandanti Kaapuram” and “Samsaram Oka Chadarangam” which tested the theme of family bonds in two different directions of staying together vs. going nuclear. “Brahmotsavam” starts to rekindle that sentiment but failed to capitalize on the promise. It is barely watchable and might not pick up steam. A lesson for innovative producers like PVP not to get carried away with narratives that promise the moon and deliver half of it. Fact Check : Pending e-challans of Maheshbabu !